Born and raised in Auckland, New Zealand, Raewyn Todd lived there until her early twenties when she decided to move to Sydney intending to travel the world. "I got as far as Sydney, fell in love with Australia, and have never left." Currently residing in Mardi, a part of the beautiful Central Coast of New South Wales in Australia, she shares her home with her husband, Gordon, her daughter Samantha, and several fur babies. Raewyn loves living in the area of The Central Coast because it is a semi-rural area with lots of native bush and beautiful beaches and a very relaxed lifestyle. Raewyn started in the bear industry as a collector in the mid-nineties and sought out everything she could find on bears in Sydney and anywhere she could get to within a couple of hours drive. 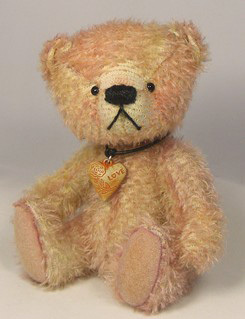 She explored the internet and found wonderful artist and collectible artist bears and was hooked. 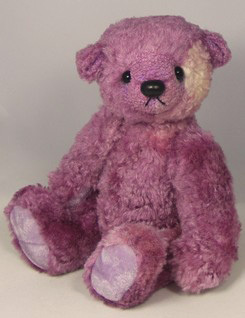 In 2005, she went to a local bear show at Gosford where she met the owner of a local craft shop that offered bear making classes and that was the start of her bear making life. 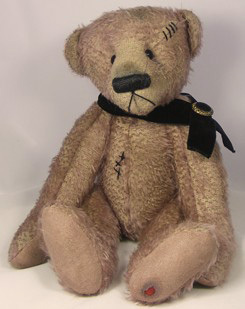 "I would have to say the greatest influence in my bear making would have to be from my dear friend Lyn Parker of Parker Bears who was the teacher at Craft on the Park in Gosford where I started. 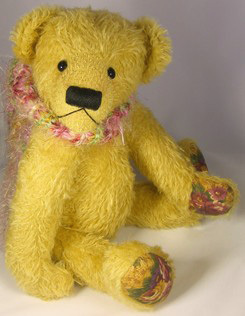 Her knowledge and patience was fantastic; not only did she teach me to make bears but also guided me through my first couple of live shows when I was a nervous wreck and has since given me endless tips for table display and guidance through my early patterns." 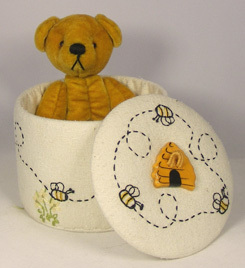 Her business name, Woodbury Park Bears, took its name from a housing estate she lived in. "I thought it sounded like a place people could see bears; like an outdoor zoo, although all we have are Koala bears in the native bush around us." 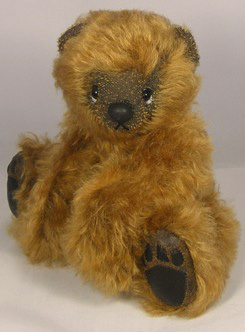 Raewyn likes to sell her bears at shows mainly in and around Sydney and also through a couple of online shows. 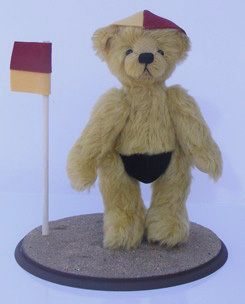 Outside of bears, she works full time in Sydney in a managerial position in the motor trade. "It can be a stressful job so my bears become my therapy helping me to unwind at the end of the day." Designing nearly 10 different patterns a year, she tweaks them for different effects and will create around 40 bears of all different sizes. "I like to mix it up with them to keep it interesting. I tend to get a bit bored repeating one pattern too many times without a change." "I think because I mix it up with my bears, I don’t really have a style of my own yet. 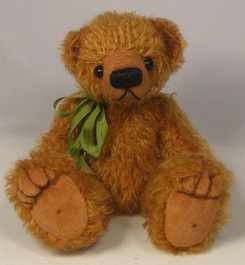 It is something that is evolving with each new bear I make. I like to use different techniques with each bear. 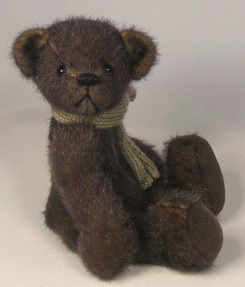 I like needle felting and I like aging bears as well. I will try different finishes and techniques to see how they turn out. I am open to experimenting and believe in pushing myself." 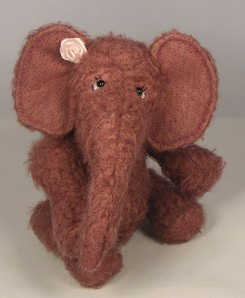 Raewyn's first pattern was published this year in the Australian Dolls Bears and Collectible Magazine which was a great experience and she has been invited to produce exclusive patterns and kits for the biggest Teddy supply shop in Sydney, “Teddys Bits,” a project she'll be working on later this year. 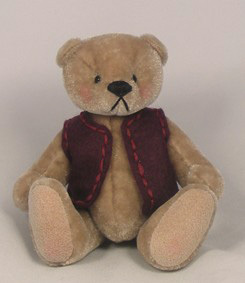 Her bears have sold all over the world and appeal to different people for different reasons. "I like to think that every bear has a new mum or dad out there; they just may not have found them yet."